Doctor Web—the Russian anti-virus vendor—conducted a research to determine the scale of spreading of Trojan BackDoor.Flashback that infects computers running Mac OS X. Now BackDoor.Flashback botnet encompasses more than 550 000 infected machines, most of which are located in the United States and Canada. This once again refutes claims by some experts that there are no cyber-threats to Mac OS X. According to some sources, links to more than four million compromised web-pages could be found on a Google SERP at the end of March. In addition, some posts on Apple user forums described cases of infection by BackDoor.Flashback.39 when visiting dlink.com. Attackers began to exploit CVE-2011-3544 and CVE-2008-5353 vulnerabilities to spread malware in February 2012, and after March 16 they switched to another exploit (CVE-2012-0507). The vulnerability has been closed by Apple only on April 3 2012. If the files are not found, the Trojan uses a special routine to generate a list of control servers, sends an installation success notification to intruders' statistics server and sends consecutive queries at control server addresses. It should be noted that the malware utilizes a very peculiar routine for generating such addresses. It can also switch between several servers for better load balancing. After receiving a reply from a control server, BackDoor.Flashback.39 verifies its RSA signature and then, if successful, downloads and runs payload on the infected machine. It may get and run any executable specified in a directive received from a server. Each bot includes a unique ID of the infected machine into the query string it sends to a control server. Doctor Web's analysts employed the sinkhole technology to redirect the botnet traffic to their own servers and thus were able to count infected hosts. Over 550 000 infected machines running Mac OS X have been a part of the botnet on April 4. These only comprise a segment of the botnet set up by means of the particular BackDoor.Flashback modification. 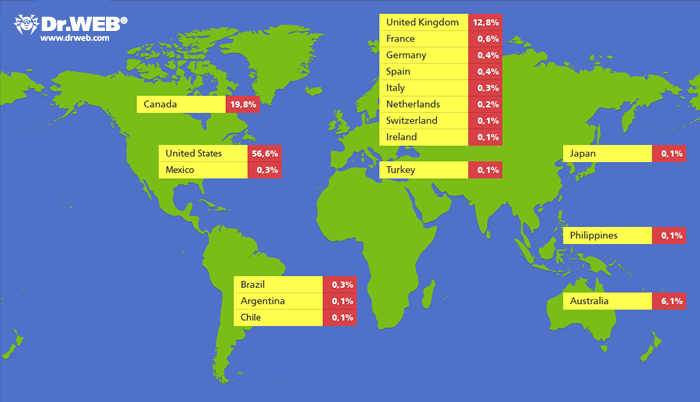 Most infected computers reside in the United States (56.6%, or 303,449 infected hosts), Canada comes second (19.8%, or 106,379 infected computers), the third place is taken by the United Kingdom (12.8% or 68,577 cases of infection) and Australia with 6.1% (32,527 infected hosts) is the fourth. Doctor Web recommends Mac users to download and install a security update released by Apple from support.apple.com/kb/HT5228 to prevent infection of their systems by BackDoor.Flashback.39.